The ball of the foot is home to the metatarsal phalangeal joints, which are the joints formed by the long bones of the foot and the base of the toes. The joints are designed to disperse pressure across the ball of the foot during the walking cycle, particularly as the foot rolls and pushes off the ground. This is a very specific function, and problems can develop when the position of the ball of the foot is altered and pressure to the joints is increased. High heel shoes force the ball of the foot to become much more prominent, leading to excessive joint pressure. As a whole, the general pain that develops from this pressure is called metatarsalgia. More specifically, some joints may be more affected than others, as either the long bone before the joint bruises, develops a stress fracture, or the tissue surrounding the joint itself (the capsule) becomes inflamed or partially torn. Additionally, arthritis can develop under uncommon and specific conditions, and pre-existing arthritic conditions like rheumatoid arthritis can worsen. 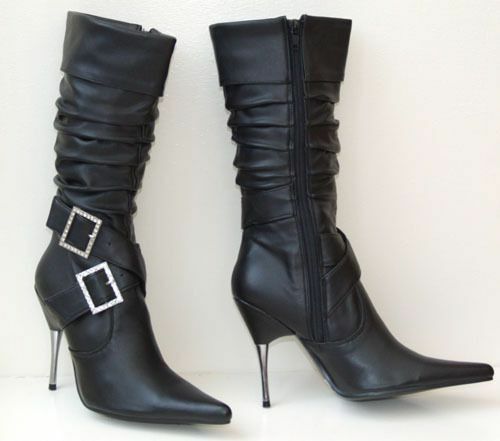 The narrow heel posts found on most high heeled shoes are incredibly unstable, especially on uneven ground. Even the most seasoned user of high heels will occasionally stumble, and an ankle sprain can be the result. If the sprain is serious enough, or if enough sprains occur, the ankle ligaments will become weakened. This results in instability, and the likelihood of more sprains. Because of the abnormal downward position the foot assumes when in a high heeled shoe, the Achilles tendon can be shortened and tightened. This important tendon is found on the back of the heel, and its function is to flex the foot downward to resist the force applied upward to the foot from the ground when walking. without it, our feet will simply flop uncontrollably upward when pushing on the ground. High heels keep the foot flexed, and reduce the flexibility of the Achilles tendon. The result is an over tight tendon that can become strained when one walks again in a flat shoe that forces it to function normally. This can lead to tendonitis, where the tendon becomes inflamed and damaged, and the tightness can cause multiple other problems to the ball of the foot even when high heeled shoes are not worn. A neuroma is swelling and scarring around one of the nerves that travel between the long bones of the foot. The involved nerves are on the bottom, and branch in two to provide sensation to two adjacent toes. The most common nerve involved in a neuroma is found in the space before and between the 3rd and 4th toes. Increased pressure to the ball of the foot as well as squeezing of the ball of the foot from side to side, both features found with high heel use, can irritate the nerve. This results in a painful condition that can feel like a hot pebble is in the foot, and can cause numbness and tingling to the toes involved. A corn (as well as a callus) is a simple protective measure by the skin to protect itself from excessive pressure. When excessive pressure is applied to the skin where there is a prominent bone underneath, the skin will thicken its top layer to shield itself from the pressure. Unfortunately, when the corn gets too thick, pain can develop. A corn describes this thickening when it is on the toes. High heeled shoes generally have a tight and narrow toe box, where the shoe is in direct contact to the toe, and the narrow fit of the shoe squeezes the toes together. In there is any slight contracture of the toe to begin with, as seen with hammertoes, the skin will thicken either on top of the toe, in between the toes, or in both locations. Eventually, this will become painful, and in some people (like diabetics or those with poor sensation or circulation), it can pose a risk for the development of skin sores under the corn. Like corns, a similar condition can develop under the ball of the foot at the base of the toes. The increased pressure at this spot caused by the high heel forcing the foot downward can lead to the development of thicker skin as a protective measure. When this occurs elsewhere than the toes, the lesion is called a callus, although technically it is the same tissue and has the same underlying cause as a corn. Calluses under the foot can be particularly painful, and can become quite deep and/or wide.